The story of local newscaster and talk show host Christine Chubbuck, who committed suicide on air, has provided fodder for movies in the past. 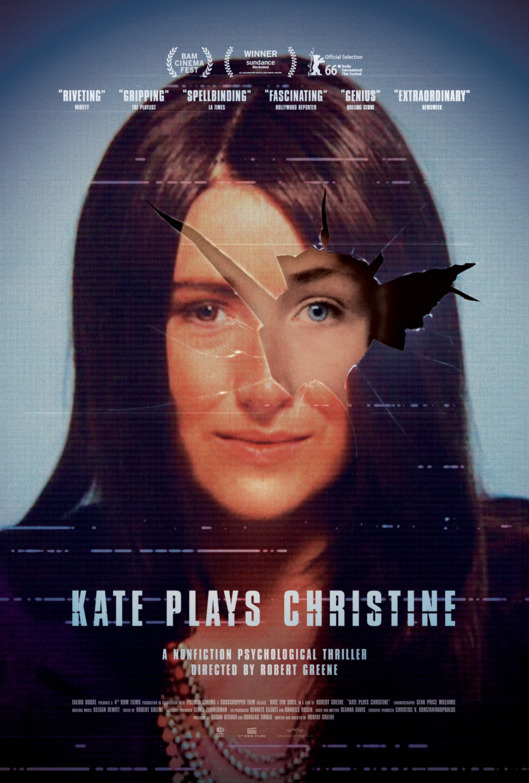 Usually it's the Paddy Chayesfsky-penned/Sidney Lumet directed NETWORK that gets mentioned, but as KATE PLAYS CHRISTINE points out early on, that film in many ways subverts its inspiration, turning the depressed and tragic Christine into the manic male newscaster Howard Beale (Peter Finch), a role played more for black comedy and satire than pathos. Ironically, it is Joe Dante's werewolf film THE HOWLING (from a script by the always sharp John Sayles) that gives more accurate voice to its inspiration. But this year, in one of those cases of serendipity that occasionally happen in Hollywood, two new films aim to tell the story of Christine without burying it in allegory. Opening next month, CHRISTINE promises to be a fairly straightforward docudrama starring Rebecca Hall in the title role. First, however, comes Robert Greene's not-quite-a-documentary KATE PLAYS CHRISTINE. The faux documentary genre is fairly well established at this point. We're generally used to seeing it used either for the purpose of eliciting laughs, as in the mockumentaries of Christopher Guest, or to generate scares, as in the countless found footage horror films to come down the pike since THE BLAIR WITCH PROJECT. KATE PLAYS CHRISTINE falls into neither of those categories. The film purports to show actress Kate Lynn Sheil prepare for assaying the role of Christine. To this end, she delves as deeply as she can into the life of her subject, interviewing anyone she can find with even a tenuous connection to the real life Christine. But no matter how much she learns, without seeing footage of Christine herself, Kate feels her performance is lacking. As she searches to find the real Christine, Kate and the audience are forced to confront the issue of depression itself, and how it is often minimized and ignored by society. We're also forced to deal head on with the issue of just how much Kate needs to see in order to play her part, and why. For that matter, how much do we, the audience need to see? As the film asks these questions, it calls into question or motives for watching. Nor are the filmmakers themselves let off the hook for dealing with this material. Sure, the film flounders at times, but its final scene makes up for any shortcomings. And while it may be a carefully constructed artifice, KATE PLAYS CHRISTINE nonetheless gets at some uncomfortable truths. 3 1/2 out of 4 stars.